The Browning X-bolt is already a tried and trusted hunting firearm, which I already own and use in its 6.5 x 55 form so when I needed a lighter calibre, another X-bolt was an obvious contender. It looks almost identical to my other synthetic stalker and straight from the box it points nicely, is light and beautifully balanced. It seems a shame to spoil that balance with a sound moderator and I’m sure there will be times when I don’t burden myself or the rifle with that extra weight right up the front. 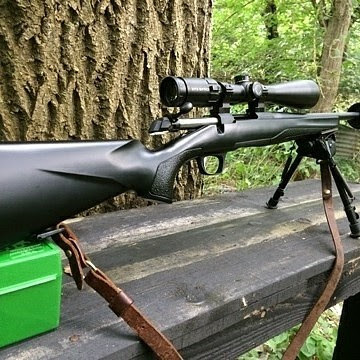 However, the practicality of a moderator can't really be contested, it deadens the report of the rifle and can reduce recoil considerably, although recoil wasn't really a concern with the .223. The new feature on this rifle is the ‘Super Feather’ trigger, which I found to be superb! I’m looking forward to having much longer to get acquainted with this lovely rifle in the coming weeks and months and to preparing a more detailed test report. 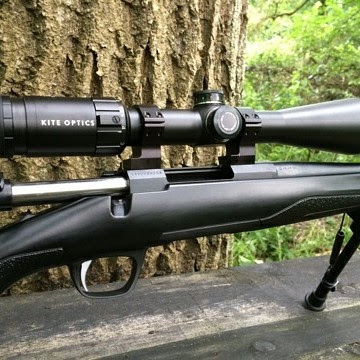 The .223 is now fitted with a kite optics scope which has a lovely fine reticle for precise shooting which can be illuminated for dusk and dawn shooting. One of the fantastic features of the x-bolt is the safety catch which allows the bolt to be operated while the safety catch is engaged. This is often not the case on rifles which require you to disengage the safety catch to open or close the bolt meaning that for a split second you have a round in the chamber and no safety catch applied. If you practice proper muzzle discipline this isn't a problem but it is nice to be able to operate the bolt with the safety applied and browning provide this comforting feature. The x-bolt is light, features a relatively short action bolt making cambering a round very strait forward and fast and the synthetic stock while not attractive is very practical. 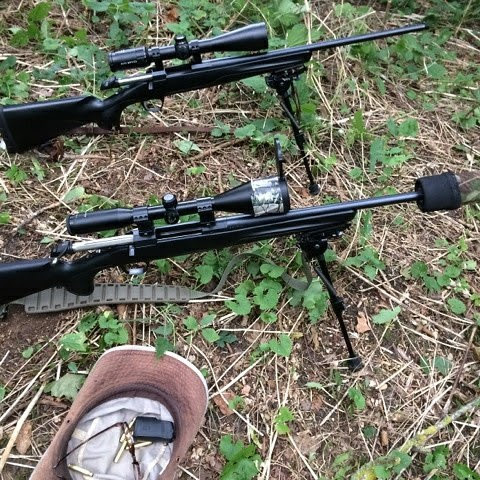 All in all the perfect stalking rifle and one which in .223 or 6.5x55mm or any other calibre can be highly recommended. 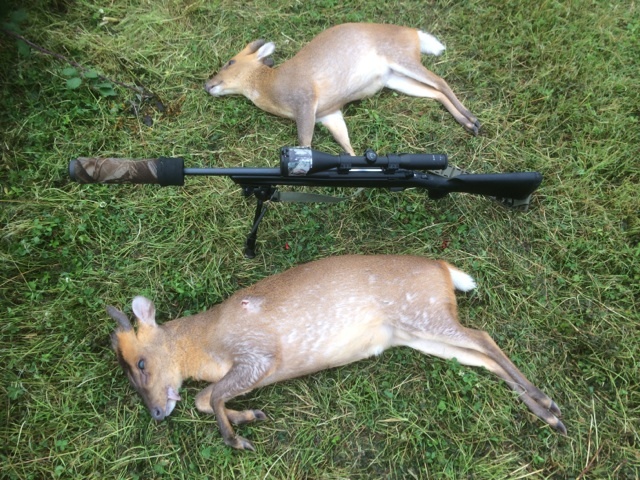 A successful stalk with the 6.5mm, two muntjac bucks in the bag. We normally feature some sort of lesson in each of these product reviews on the bushcraft education blog but in the interest of giving the topic of todays lesson a bit more space it will be released tomorrow as part of out Bushscience series. In it we'll cover terminal ballistics, in simple terms that is how a bullet behaves once it has struck something. 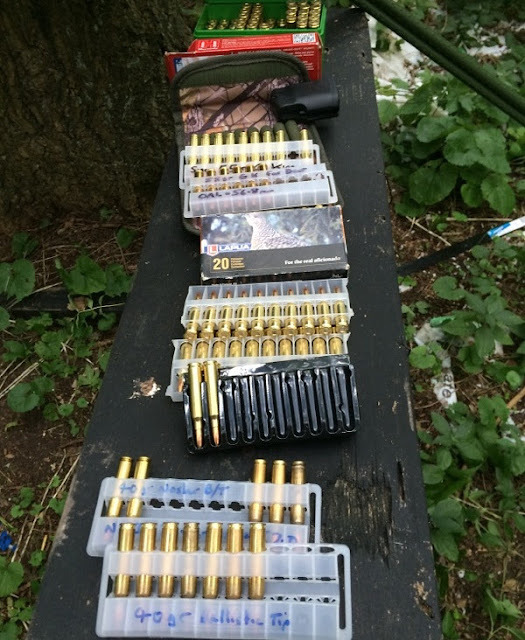 This is important to understand for anyone using firearms to cull deer or to take any other wildlife for the pot, it relates to what firearms and types of ammunition are legal for use to kill deer and how we choose our shot placement. Check it out here tomorrow.